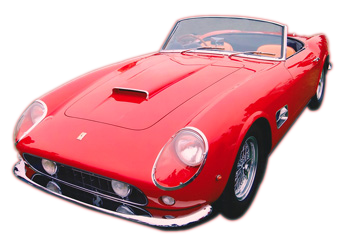 Legendary 250 GT California is now available from Norwood Autocraft. Limited production Ferrari California for sale. Few Ferrari collectors can afford the $10 million dollar price tag on an original Ferrari California 250 GT Spyder, but Bob Norwood is offering the next best thing: a California Spyder rebody, at a fraction of the price. Currently in production, the GT 250 California Spyder lives again. The chassis is shortened from the 2+2 configuration to SWB Ferrari length and, using three-dimensional digital scanning technology, is rebodied in alloy to the same dimensions as the original Ferrari California GT 250 Spyder. Each of the cars in this limited production retains the original 330 serial number and is a real Ferrari, not a replica. Experience the thrill of driving the GT 250 California Spyder, a high performance collector sports car priced to be on the road, rather than in a museum! For more information on specs and availability, click here.